This past Saturday my friend from Fort Dodge and I ran the Kentucky Derby Festival Half Marathon. It was lots of fun. Both of us did much better than we were expecting and neither of us was injured. Our wives took lots of good photos. There were also professional photographers along the way who took photos. If there is a good one of me I might buy a print. I retired my shoes after the race. I added up the miles on them and it was over 350 so it was time for a new pair. I bought the same kind - Asics Gel Nimbus 9's. I didn't like them at first because I always ran Nike Air Max's but they have grown on me. I am going to try to run another half marathon in June. If I can't schedule a half marathon I might try a 10K. I have never raced that short of a distance and I am curious. I just finished reading the book Triple Cross . It was suggested to me by our man in the field from Ledyard. It is set in Louisville in the 2 weeks prior to Derby - in other words RIGHT NOW! I read the book on my flights to and from Fort Dodge last week. As a result of those flights something so important is brewing right now that it is Earth shattering in nature, at least as it concerns me and my family. In fact, the things that are happening right now in my life are so monumental that it almost merits another blog. More on those fronts later. For now, I will give the book Triple Cross a rating of 8.75/10. I really enjoyed reading the book. The setting is in Louisville and the author captures the town pretty well in the novel. All of the things mentioned in the book are pretty similar to the things I have encountered in Louisville. Also I jog in the neighborhood most mentioned in the book. If you are in the mood for a a decent mystery, check out or 'man in the field recommended' mystery novel Triple Cross . Its a quick read and I enjoyed it thoroughly. One of my favorite recipes for sandwich bread comes from the book The Bread Bible. The Bread Bible and my other favorite bread book The Bread Baker's Apprentice are my go to books if I need to bake bread. Combine all of the above ingredients in a bowl and mix until smooth. Don't mix the ingredients in. Just cover the bowl with plastic wrap and let it sit on the counter from 1 to 4 hours, depending on how long you have. Letting it sit longer will develop more flavor. Pretty soon the stuff beneath will bubble over the top of the dry flour ingredients. Meanwhile put 1/2 cup bulgur wheat and pour over 1/2 cup of boiling water. Let it sit for an hour until all of the liquid is soaked up. 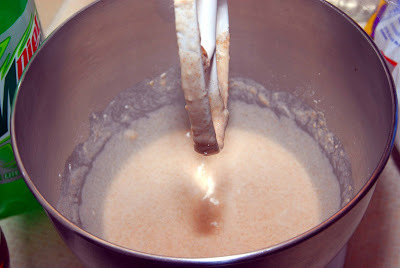 Mix with the kitchen aid mixer for 10 minutes. 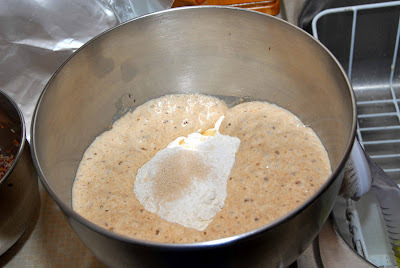 Cover the bowl and let rise on the counter until doubled in size, 45 minutes to 1 1/2 hours. Preheat oven to 350 with a baking stone on the bottom rack and a cast iron skillet on the floor of the oven. 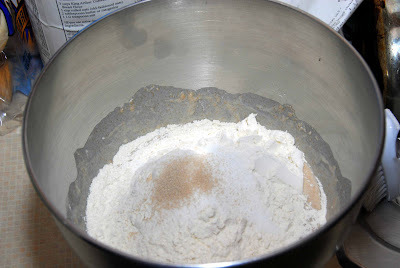 Shape the dough into a loaf and place in a greased loaf pan. Let the dough rise again, covered with plastic wrap, for a while until the dough is within 1/2 inch of the top of the loaf pan. Brush the top of the loaf with melted butter and slice it 1/2 inch deep down the length of the loaf. Slide the loaf into the oven on top of the baking stone. Add 1/2 cup ice to the cast iron skillet and close the door. Bake 45 to 55 minuets until the top of the loaf is pale golden brown and a toothpick inserted in the center comes out clean. Remove from the oven and brush the top with a little melted butter. Let cool on a wire rack to room temp before cutting. 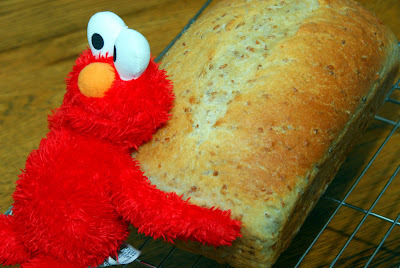 Our little one wanted Elmo to pose with the loaf. 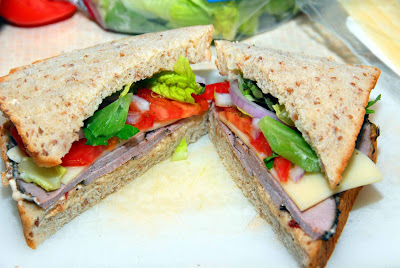 It made a great roast beef, Swiss and chipotle mayo sangweeech! 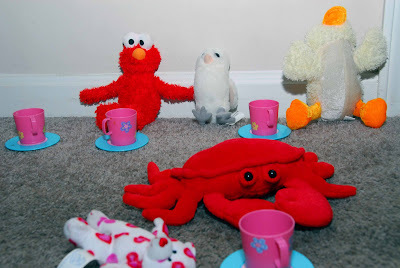 After a while, our little one had a tea party for Elmo, Mr. Owl, baby duck and Mr. Crab. Baby spotted bear also made an appearance. All parties were winners! 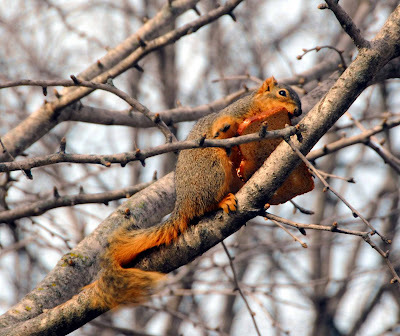 PS - research shows that this is our most popular post ever in the toddler demographic. Elmo, Mr. Owl, Mr. Baby duck and Mr. Crab are very popular figures in the toddler world. We had a little earthquake in Louisville today. I was awake typing an email at the time and the wife was awake as well. It was a 5.4 magnitude earthquake that had its center 153 miles from Louisville. Initially I thought our upstairs neighbor had jumped out of bed but then the walls started shaking as well as the floor. It lasted about 30 seconds I think, with the worst part being about the first 10 seconds. Our first thoughts were that it must be outrageously windy. I looked outside and it was dead calm. Then we thought that maybe someone crashed into out building but that wasn't true either. On the way into work I heard on the radio that it was an earthquake. 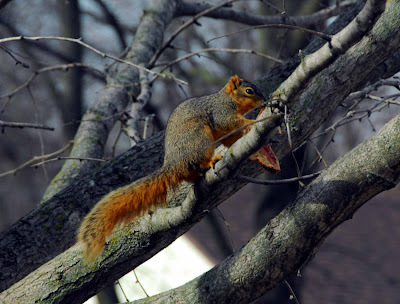 I snapped a few pictures of a squirrel carrying a piece of toast with jelly up the tree. 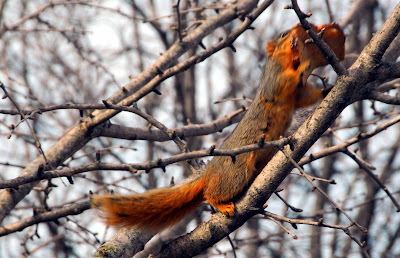 After I shot these he jumped from the tree to the roof. I bet someone has an attic full of all sorts of goodies. Here is a recreation of the scene. 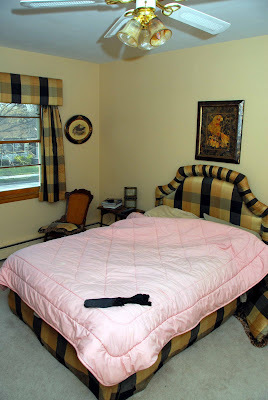 The bedspread and the sheets were thrown out already. 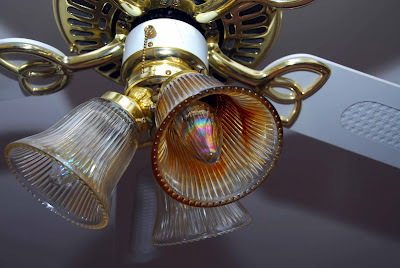 If you look closely at the lamp you'll see that one of the light fixtures is burnt. What happened was for some reason the lamp threw a few sparks down onto the bed. Instead of landing on the bed they landed on my dirty sock, which just happened to be laying on the corner of the bed. If the sparks had landed first on the mattress I bet the house would have burned down. For once, all agreed that my occasional slovenliness was a good thing! Yesterday morning we were sitting drinking coffee and reading the paper. We were really enjoying ourselves when our dog ran down the stairs and did a couple running loops around the kitchen. Her odd behavior led us to believe that she needed to go outside urgently. So we put her outside. A couple minutes later we started smelling burnt toast. Actually I didn't smell anything because I have a stuffy nose right now. The smell gradually got more and more intense. Eventually my father in law was alarmed and ran around looking for the source. My wife's immediate thought was that she left the curling iron on and burnt down the house. They ran in and checked - no fire. 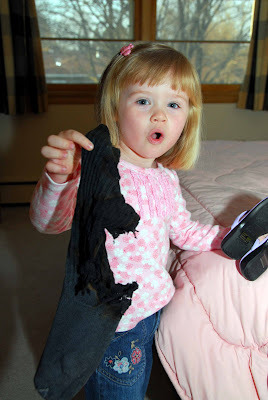 Then they tracked the smell to the bedroom and saw my black sock sitting on the corner of the unmade bed shooting flames up about a foot off the bed! I was recently forwarded an email string that has been going back and forth between family members regarding buckwheat pancakes. My great grandmother was the cook of all cooks. She used to make delicious buckwheat pancakes that people still rave over. I was up in Ledyard a while ago and my great aunt made me some of these famous buckwheat pancakes. The thing people like about them is that they are tangy. Because you let the batter sit on the counter overnight and it has yeast growing, these are actually a form of sourdough pancake. I wrote about her recipe for buckwheat pancakes shortly after I at them. You can find the recipe by clicking this link. I was in the doctors lounge today and HBO was playing on the TV. There was a movie starring Eric Bana and Robert Duvall. It looked like a real stinker but there was a scene where Eric Bana was riding a Triumph! In the few seconds I was able to watch it, he seemed to be a really sappy dope. I stopped back by later and the movie was still on but Eric had a black eye. I wasn't surprised because after seeing the character for all of 30 seconds I could see how he might catch a smack now and again. I used to have this game when I was a kid and it was a ton of fun. It is long out of print but I just found a copy of it on Ebay for $5. 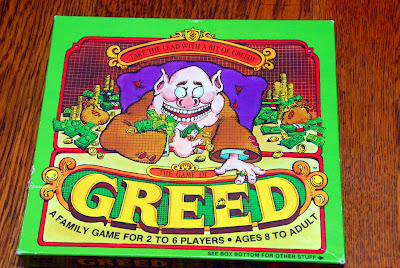 It is a pretty straightforward game but it involves bluffing and such so its a lot of fun. I'm going to try to make a version that you can play just with a regular deck of cards and some play money. 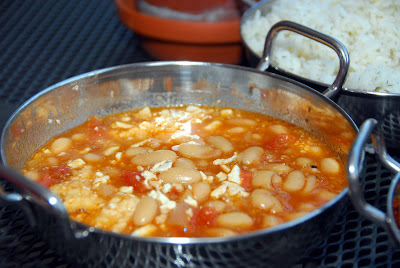 Another tasty dish to serve with the meatballs is Greek Baked beans. Preheat oven to 375. Make the sauce by heating olive oil in a saucepan. Saute the onions. Add remaining ingredients except beans and parmesan. Bring to a boil. Mix in beans and pour into a shallow baking dish. Bake, uncovered for 30 minutes. When beans are done sprinkle top with the cheeses. Dilled lemon rice is a pretty classic dish at least at Greek restaurants. We made some up last night to go with the meatballs. It is easy to make, just follow the directions for making rice on the bag but instead of using water, use chicken broth. 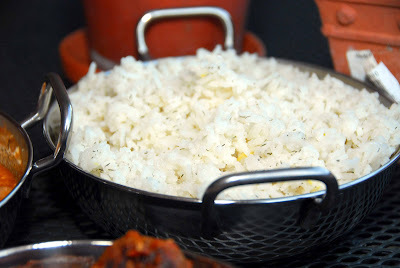 At the end when the rice is done stir in 2 T lemon juice per cup of dried rice that you used and 1 t dried dill weed. You could also use fresh dill but it is out of season right now. I also grated a little lemon zest in just to add interest. Yum! What is your favorite car ever? Mine was a 1982 Dodge Ramcharger. I loved it so much that I have recurring dreams, even to this day, that I am driving around in it. One of these days I am going to buy a Ramcharger and restore it to its awe inspiring beauty. 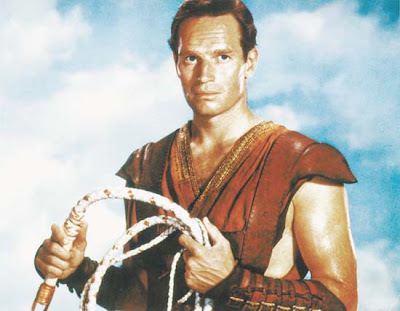 A true man's man, Charlton Heston, has died. I hope he rests in peace. He is from the greatest generation and one of the last of his kind. They really don't make them like Charlton Heston anymore. You owe it to yourself, as a human, to see a few of his movies. To peel tomatoes just heat a pot of water to a boil. Drop in the tomatoes and boil for a minute or so. Then scoop the tomatoes out of the boiling water and drop them in ice water. In a medium saucepan over medium heat, heat olive oil and sauté onion until soft. Stir in garlic and tomato paste. Add the peeled tomatoes, squeezing tomatoes to break them up. Bring to a boil. Add wine and sugar, and season to taste with salt and pepper. Reduce heat to low and simmer uncovered until just starting to get thick, about 20 minutes. Add pepper flakes and butter, simmer 1 to 2 minutes. At this point you can run the sauce through a strainer or leave it alone, depending on if you want tomato seeds in the sauce or not. 2. For the meatballs: Heat oven to 350 degrees. 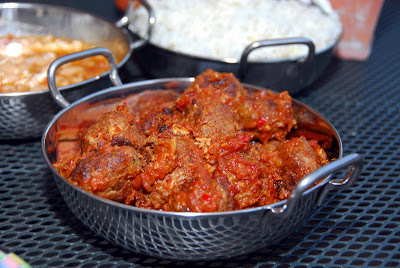 In a large mixing bowl dump all of the meatball ingredients and stir until very well combined. Mix in enough extra-virgin olive oil to make mixture glossy and elastic. 3. Shape meat mixture into meatballs and place on an oiled tin foil lined cookie sheet. Bake at 350 for 1/2 hour until done. 4. Lightly oil an 8-by-10-inch shallow casserole, or other baking dish in which meatballs will fit in a single layer. Pour sauce evenly on top of meat, and bake until lightly browned on top, about 20-30 minutes. I saw a really good movie today called The Long Goodbye. It came out in 1973 directed by Robert Altman. It stars Elliot Gould as a private detective. If you get the chance either rent it, buy it or check it out from Netflix. Another good film by Altman that came out in 1974 was Thieves Like Us. It starred Kieth Carradine and was about some bank robbers during the Depression. I think I may have gotten this recipe from Cuisine At Home. It is our go to cheesecake recipe because you can change it based on what fruit you add. Preheat oven to 300 degrees. This takes about an hour to prepare but it must cool and then chill in the refrigerator for several hours before serving. Prepare the night before or on the morning of the day you wish to serve this dessert. Process 2T sugar, a pinch of salt, 4 chocolate and 4 regular graham crackers (whole sheets) in a food processor. After you have a finely ground consistency add 3T melted butter to the processor and pulse. Press into the bottom of a 9” spring form pan. 10-14 oz fruit of your choice. Strawberries, raspberries and blueberries all work well. If necessary frozen berries are ok. Pulse in a food processor until smooth. Add 2T fruit preserves of the same flavor as the fruit you choose for the sauce. Transfer to a sauce pan. Add 3T sugar, the juice of half a lemon and simmer. Add 2 tsp. cornstarch dissolved in 2 T water and whisk until thickened a little bit. Chill in the refrigerator. Melt 8 oz chopped white chocolate in a double boiler. Blend 16 oz. cream cheese and 3/4c sugar in a mixer. Add 3 eggs separately, beating well after each egg is added. Add 1 tsp. vanilla and the juice of ½ a lemon. Pour in melted chocolate and mix until combined well. Pour into spring form pan lined with the crust. Drizzle a small amount of the chilled fruit sauce (about 1/3 – 1/3 cup over the top and swirl with a toothpick so it appears marbled. Place pan on a cookie sheet and bake 60-80 minutes at 300 degrees. The cake is done when the edges set and puff slightly but the center is still somewhat jiggly. Crack the oven door and turn off the heat. Place a wooden spoon to prop open door and cool in the oven gradually for an hour. Then remove and cool on a wire rack completely. Remove the cake from the pan. Cover with a kitchen towel and refrigerate for at least 3-4 hours or overnight. 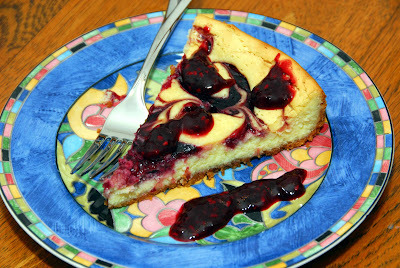 To serve, drizzle some sauce on the plate, place a piece of the cheesecake on top and drizzle with more fruit sauce. My favorite cooking magazine is Cuisine at Home. The recipes in there are usually extremely good and easy to make. As an added bonus it is published in Des Moines, Iowa. A weird coincidence is that it is published at 2200 Grand Avenue, exactly 4 blocks from where I am building my Plastic Surgery office! 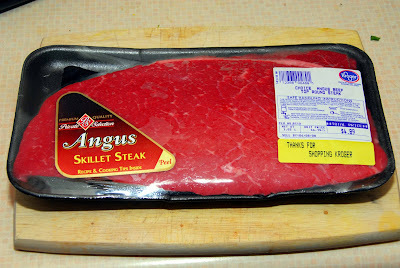 I've written quite frequently about my love of minute steaks (cube steaks). The last time I wrote about them was this February. I was extremely pleased to see that in the April issue, Cuisine at Home did a whole special on cube steaks. I decided to try their recipe for Swiss Steak. 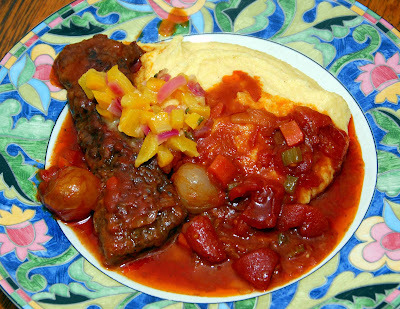 Cuisine at Home jazzed it up a little bit by serving it over goat cheese polenta (another of my favorites) and adding a chowchow relish over the top. They also made their own cube steak from top round. You know how much I like do it yourself style food! I cut the recipe in half because there are only 3 of us. I also changed a few little things to suit my kitchen. Preheat oven to 325. Dredge the steak in flour and sear in olive oil in a Dutch Oven. 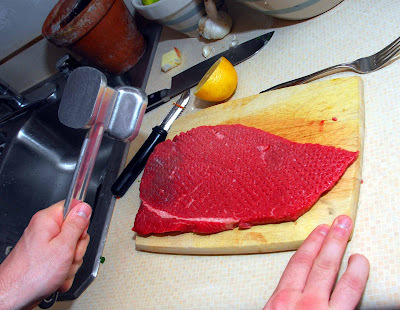 Remove the steak from the pot and add in the onion, carrot, celery and garlic. Saute for 2 minutes. Add the tomato paste and cook for another minute. Finally deglaze the pan by adding in the brandy. Simmer until almost evaporated. Dump the rest of the ingredients into the dutch oven, cover and bake in the oven until tender. Cuisine at home suggests a cooking time of 1 hour. Combine 3 cups of water with 1 cup yellow cornmeal and bring to a boil, stirring often. When it is boiling reduce heat to a simmer and cook about 5 minutes. It should thicken up considerably to look like polenta. Remove from heat and whisk in 4 oz goat cheese, a little cayenne pepper and salt to taste.